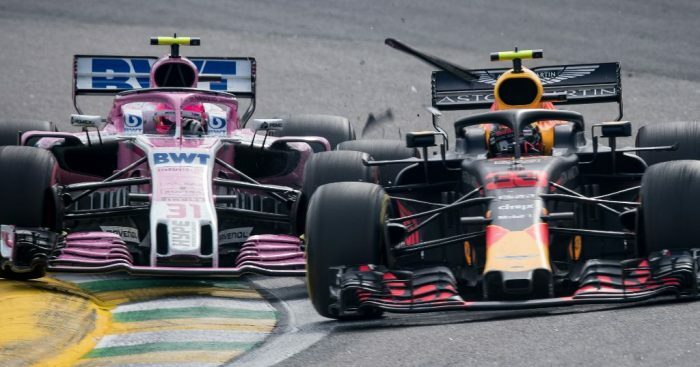 Helmut Marko is crying foul after Max Verstappen clashed with Esteban Ocon at the Brazilian GP, the contact meaning another Mercedes driver – Lewis Hamilton – won the race. Verstappen was the man to beat in Sunday’s Brazilian Grand Prix as his RB14 showed supreme pace compared to the Mercedes and Ferraris. The Dutchman was able to easily user his fresher tyres, courtesy of a longer first stint, to overtake Hamilton to lead the grand prix. However, disaster struck on lap 44 when Ocon went to unlap himself. A lap down on Verstappen, he took the inside line only for the two to collide at Turn 2. Both spun with Verstappen losing the lead, and the grand prix, to Hamilton. “A Mercedes driver, who is promised a seat for 2020, that crashes into the leading car – unbelievable,” the Red Bull advisor told Germany’s Motorsport-Magazin. He continued his conspiracy rant when talking with ORF. “A runner-up, who is under contract at Mercedes, pushes the leader off the track,” he said. “And then he only gets a stop-and-go penalty of ten seconds… I don’t want to comment any further on it, but I’ve never seen anything like that. Mercedes refused to rise to the bait. Asked about Marko’s comments, motorsport boss Toto Wolff told ESPN: “This is how Dr Marko sees the world and I want to leave it with that.